So, my first real stab at drafting, eh? I have skipped the princess seam and gone with a French and waist dart for the bodice which is how the original is drafted. The first problem I have with the sloper is that it looks worse in photos than in real life. I’m not sure how to interpret that. At any rate, the waistline measures two inches below my actual waist. The back, is more complicated. I still need to raise the waistline and possibly shorten the back. I also added a total of four inches to the hips between ease and other adjustments. But, there are still wrinkles around the darts and I think I know why. Boring part forthcoming. This is my sloper. The darts are angled rather than straight. That’s because of the horizontal dart I take to make my swayback adjustment. My instructor pointed out they should be straight. I think if I straighten them out, those wrinkles will subside. Because there is a ton o’ ease back there. I’ve already adjusted my pattern pieces and will crank out another muslin tomorrow with those changes and hopefully, the skirt ruffle. When it comes to fitting I use gingham fabric with one-inch squares (you could use smaller sized squares, if you want) right on my body. 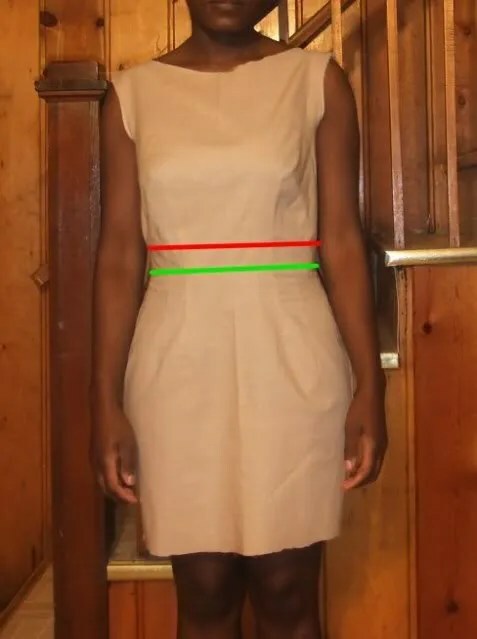 It is hard for me to explain this, because I am not a teacher and I am a lazy writer…Say you want to make a skirt (one of the easiest), you cut four pieces longer and wider than your actual body–think of yourself in sections (two pieces for the front, two pieces for the back). Working with masking tape (it will stick to your skin without taking up any hair and it is easy to pull off and put back on without losing its stickiness) and pins and a sharpie marker (in two or three colours), the full-body ruler of the gingham fabric is perfect for making a pattern on your body. You can see why the wrinkles are happening, and easily correct them. You can make the perfect dart for your body without having to guess-measure; they can be as wide and long as you need them and you can curve those darts exactly where your body needs/wants them. You can make the perfect armholes and sleeves for your body. You mark everything, using the marker, on the fabric whilst it is on your body. Then, you pull it off, and, voila!, there you have your pattern, which you can place down on to paper, which you can then place on to the company made fashion pattterns. P.S. I get your blog in my reader, but I have never commented here before, so that is why this comment may seem a bit “out of the blue”. 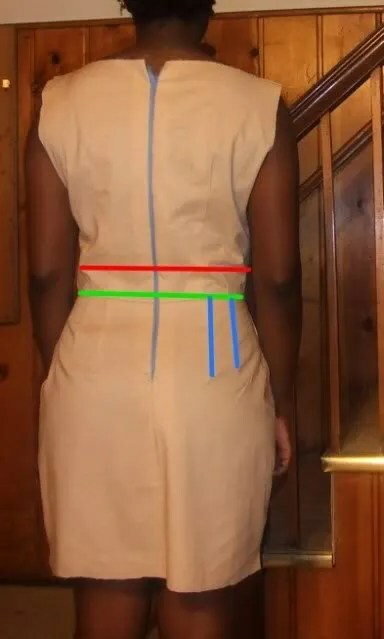 If you plan to raise the waistline, perhaps you should look at the skirt part with the waist in the higher position first before you make alterations to the darts. Oh, the other bit that I forgot to add: Using gingham, with the squares, you always know where the grainline is. You never have to wonder if you are knocking the design off grain when you pull in some of the fabric for a dart. It helps you to keep sight, without guessing, of the center-front, the center-back, lines. It helps you know if you pull the fabric, for whatever reason, if your seam lines are no longer perpendicular to the floor, or if the shoulder seem has been pulled back or forward. It is a great visual aid for fitting directly on the body. If one cannot afford a full body mannequin, this is just as good, if not better. Awesome start if you ask me. You are so good – this looks absolutely great, and you’re working through all these so well. It’s so hard – well, let’s admit it – impossible, to fit yourself. If you were my clients this would be a piece of cake, but to do this on yourself is sort of like fitting in the blind…trial and effort at best. Can’t wait to see the next installment. That gingham idea is brilliant. I totally agree with your teacher about not having darts off grain, the back waist ones I mean. You might want to take a very tiny bit off the front armholes? But mostly I think you need to narrow the upper back considerably – see those long vertical wrinkles? The gingham is fine for troubleshooting grain problems, but light-colored muslin like this shows wrinkles better, so both have their pluses. Ginham is also distracting because it’s so incredibly unflattering in that sheath shape..
With all that, keep in mind you’re still way ahead of most RTW :-). Keep it up! this is fascinating. I hope I get the time to try out everything I’m learning from you someday. Actually, the draft is looking really good. The fit issues you’re having are very likely due to the fact that you stopped short of a perfect fit when working on your sloper, in order to get it in on time. 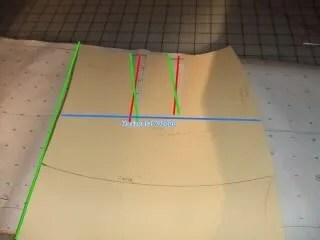 The fit issues you have in the back are reflections of the same fit issues you have with your initial sloper, and same goes for the skirt, Although she’s absolutely right that you need to straighten out the darts. Darts shouldn’t angle in the skirt back or front, but should be symmetrical and vertical. That’s something that you need to true up after making that back alteration. 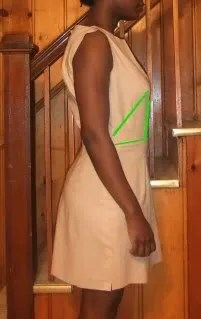 I’m also seeing that you probably want to add a touch of length in the upper bodice between the neckline and your bustline. After you get that sloper fitting better the drafting will become pure pleasure. I am enjoying reading and watching your progress, but please, will you explain to me what a “sloper” is? Thank you. Keep at it; i can’t wait to see the finished sloper and dress!